Well, it turns out that I’m not as good at updating this blog as I hoped to be. But, there are other places to follow me, my work and the gallery. Click here to follow the 23 Sandy Gallery blog (shown at right). Click here to follow me, personally, on Facebook. Click here to follow the 23 Sandy Gallery page on Facebook. 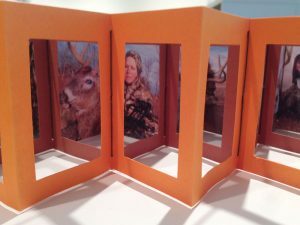 I was recently asked to create an artist book about Diana, the Goddess of Hunting. In researching Diana, I discovered the story of Diana and Actaeon, the deer hunter. Having grown up in a deer hunting family in the Midwest this story really hit home. But, having grown into a non-hunter myself, this story has also brought up a lot of mixed feelings—for example, an appreciation for the passions of the hunting men in my family, a disinterest the sport itself, and a concern about gun violence. Hunting is a sport where men hold all the power—so opposite to everything that Diana is about. Today, women hunters are the sport’s fastest growing demographic. These modern day Diana figures are skilled with bows and guns, love the thrill of the hunt, the community, the competition, the victory of a trophy, and providing food for their families. I’m intrigued by the idea that women have innate qualities that might make them better hunters such as patience, perseverance. Some say women even have better spatial vision, better ability to see the deer through the trees. After much time delving into Diana, this book has turned into a series of six artist books. Magnificent Beast (shown in orange photo above) is the first and Bold Heart (shown at top of page) is the second in that series. Click on the links to learn more about these books and stay tuned as I complete the next four books in the Modern Day Diana series. You can be a part of the next Modern Day Diana project—a deck of trading cards of female hunters and their trophy deer. 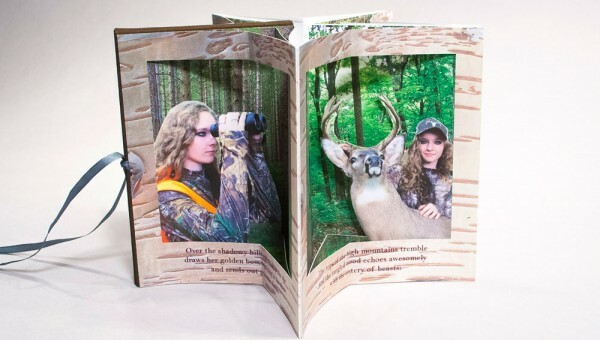 See the Call for Photos of female deer hunters here. Anything Helps Wins an Award! Exciting news! My book in the fourth annual Puget Sound Book Artists (PSBA) members’ exhibit at the University of Puget Sound Collins Memorial Library won the Collins Library Award. Huge thanks to Jane Carlin and all of the PSBA members who work so tirelessly on these exhibitions. You can see the PSBA announcement here. 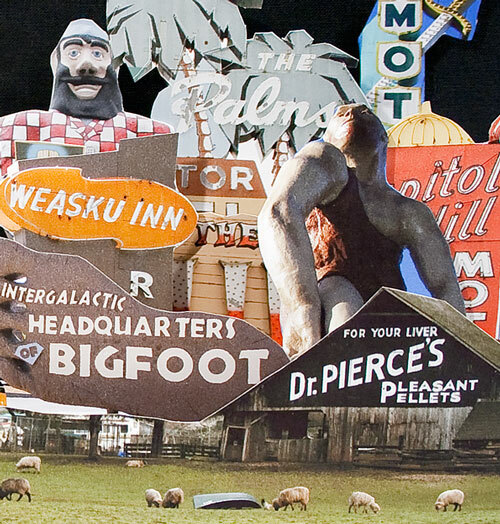 Can’t wait to head to Tacoma this summer to take in the Puget Sound Book Artists (PSBA) 4th Annual Members’ Exhibition. This exciting show includes my most recent book, Anything Helps. Being a huge fan of the PSBA, I am green with envy at the community that has formed amongst PSBA members in the Tacoma/Seattle/Olympia area. This organization has it all: an active membership, an organized board, regular events and exhibitions, workshops and a super supportive and nurturing leader in Jane Carlin, the library director at the Univeristy of Puget Sound, who was the driving force behind the founding of this organization. The fourth annual members’ exhibit will be held at Collins Memorial Library on the University of Puget Sound campus located in Tacoma, Washington. 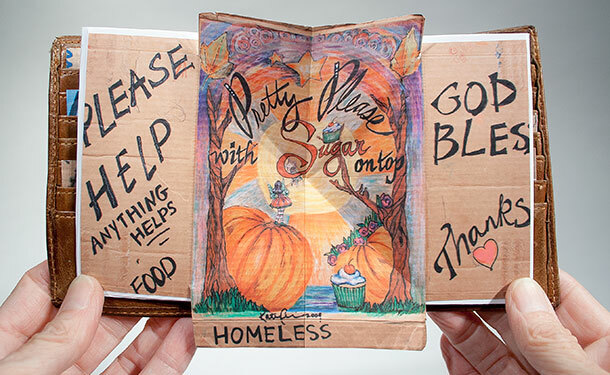 The exhibit features 57 handmade books by 39 artists from the Puget Sound area and beyond. Exhibition dates: June 5 – July 31, 2014. 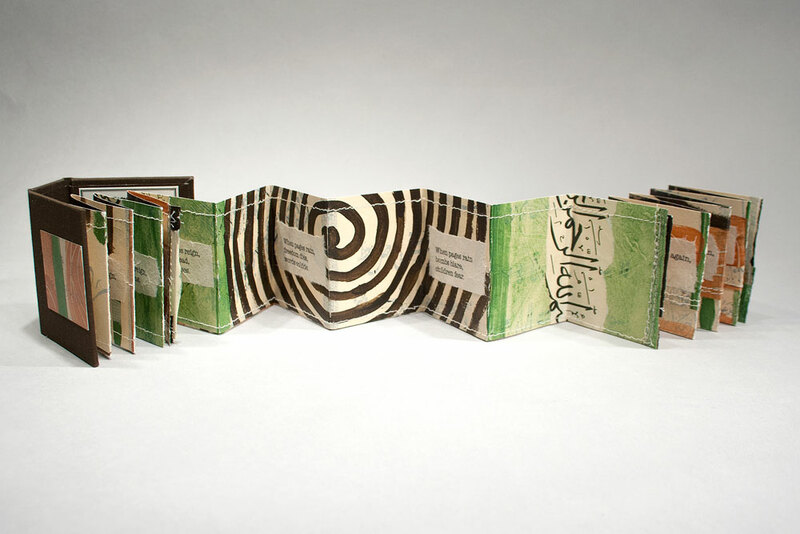 If you are a fan of the book arts you should stop in and see this show soon! Click here to learn more about the PSBA and become a member soon. In early January I attended the College Book Arts Association conference in Salt Lake City and wow(!) what an experience. It was the most amazing weekend of old friends, new connections and copious inspiration. A heartfelt thank you to the Utah band of conference organizers, including the ever-amazing Marnie Powers-Torrey, who all flawlessly pulled off a fantastic event. One of my favorite parts of the conference was the Cornered Folded Form Exchange. 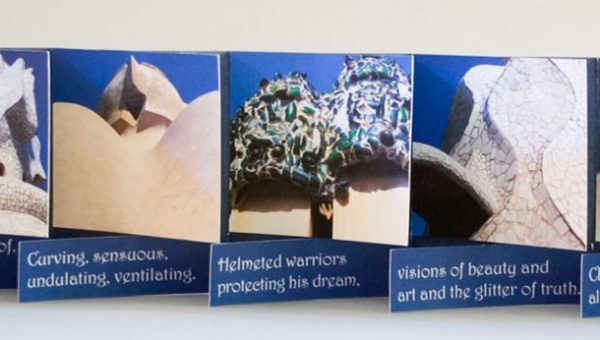 Each participating artist sent in 33 copies of a folded form. The fine folks in Utah then assembled a packet for each participant containing 30 pieces from other artists. They also created a gorgeous box to hold all of these goodies. My box contains fantastic folded forms by such stellar artists as: Julie Chen, Macy Chadwick, Chip Schilling, Jeff Rathermel, Mare Blocker, Nanette Wylde, Jessica Spring, Peter and Donna Thomas, Marnie Powers-Torrey, Rebecca Childers and many more very talented artists who are new to my eyes. My own contribution was a very fun maze book that uses letters from vintage Las Vegas neon signs to spell out, “Go to your studio and make something” when you fold the maze our flat. If you are reading this, send me an email and I will send you a free copy of my little marvel. Thanks again to all my Cornered friends! Well, it’s been a while since I’ve posted any news. So sorry for such a long time away! Must get back into the habit of being an artist again. 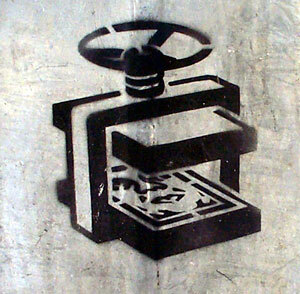 This work of found street art was great inspiration to do just that. Last week I attended a meeting of our local Portland Book Arts Guild. We had an assignment based on a selection of cards from Barb Tetenbaum and Julie Chen’s Ideation Cards. The book that I made for that assignment came from this piece of street art that I found pasted to an electrical box in Bellingham, Washington a few years ago. I have no idea who the artist was who created this terrific “pasteup.” A pasteup is a printed or photo copied sheet of paper that is glued to a traffic pole, building or perhaps an electrical box that often contains some political or artistic message or original art by the usually unknown artist. 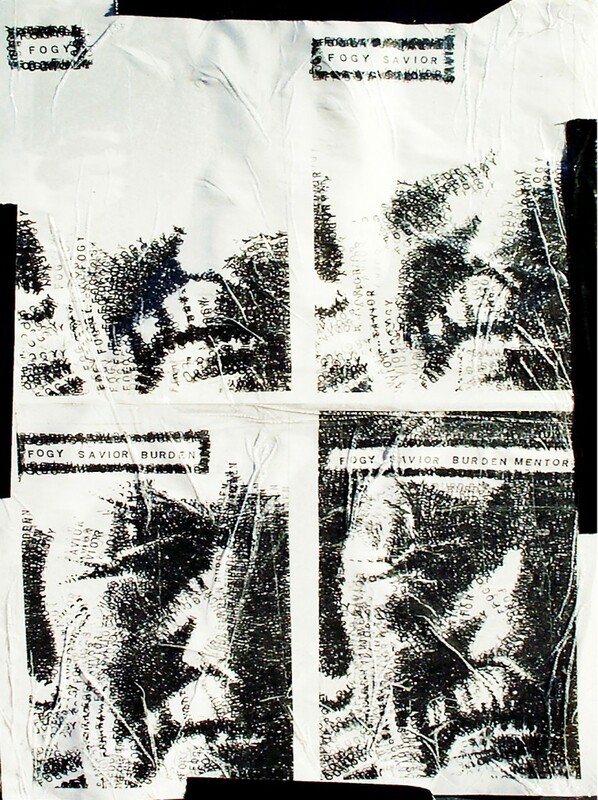 This particular pasteup titled, “FOGY, SAVIOR, BURDEN, MENTOR” was four sheets of 8.5 x 11 inch photo copies attached to an electrical box with duct tape. The four panels show a progressively growing portrait created by rubber stamping a new word on each panel. The first panel at the top left uses only the word “FOGY.” The second panel a the top adds the word “SAVIOR” and so on. The resulting portrait image is a haunting face of an old person. For our assignment I used this pasteup to make a small booklet made from one sheet of paper. The front side contains the image you see at right and the back side of the sheet contains the final fourth panel blown up large enough to fill the entire sheet of paper. A simple slit and two folds made it into a small booklet. If you are reading this blog post and you send me an email I will send you a copy of this powerful little booklet just for the asking. Find my email address on my contact page. Send me your address and I’ll send you a book. I’ve been thinking of food a lot lately as we prepare to open a big new juried exhibition at 23 Sandy called FEAST! This show is all about food and book art and has some mouth-watering books! My own book for the show is still floating in the air between my ears and hopefully will get out before the opening on May 10th. In the meantime, here’s a sneak peek at what’s percolating. Cross your fingers for progress soon! As you may know I spent nearly 20 years in Denver. It was a terrific city for me. I loved exploring the desert southwest and really miss the clear blue skies and sunshine. I even met the man of my dreams in the Mile High City. Through April 6 my artwork is back in Denver. My new book, All Sinners Welcome is happily included in Photo Book Works, a national juried exhibition at Abecedarian Gallery in the Santa Fe Arts District. Denver’s Month of Photography is a new event since I left town 10 years ago in June (wow, how time flies!). I wish I could be there to see so many old friends and their fantastic photography. If you happen to be in Denver during the show, please stop by and say hello to Alicia at Abecedarian Gallery. Or, read her blog post about the show here. Recently, I had the great honor of participating in The Al-Mutanabbi Street Coalition, a global book arts’ response to the car bombing of Al-Mutanabbi Street in Baghdad on March 5, 2007. Beau Beausoleil founded this amazing project as a call to book artists to react to this horrific event. “On March 5th 2007, a car bomb was exploded on al-Mutanabbi Street in Baghdad. Al-Mutanabbi Street is in a mixed Shia-Sunni area. More than 30 people were killed and more than 100 were wounded. Al-Mutanabbi Street, the historic center of Baghdad bookselling, holds bookstores and outdoor bookstalls, cafes, stationery shops, and even tea and tobacco shops. It has been the heart and soul of the Baghdad literary and intellectual community.” Beau teamed up with the also-amazing Sarah Bodman in asking book artists to join the project and further enhance the work of the Coalition by creating work that holds both “memory and future,” exactly what was lost that day. You can learn more about the project here. My book for this project is titled Pages Reign. 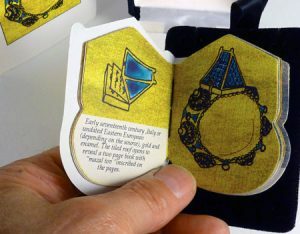 It is a miniature painted book (meaning that it is 3 x 3 x 3 inches or less) created in an edition of just four copies. Three are being sent to the project and one for my own archives. When pages reign, freedom reigns. When pages reign, thought reigns. When pages reign, words reign. When pages rain, freedom dies. When pages rise again, hearts rise. Thank you Beau and Sarah and all of the other artists who participated in this project, cheered each other on and created a heart-warming tribute to so many lives and freedoms that were cut much too short. Big Foot, Big Men and Pleasant Pellets! A quick teaser shot of my newest in-progress book documenting Highway 99, which runs through the entire state of Oregon. This new book will be on exhibit in Denver very soon. In fact, it needs to ship next week. This book is volume two of my Hit The Road series covering Highway 99, which runs all the way from Canada to Mexico. The first volume, which you can see here, covered the state of Washington, this one is Oregon and California is due up next. Now, that will be one loooong road trip! I am thrilled that my print on demand book, Bless This House was selected for inclusion in the Cleveland Museum of Art’s exhibition, DIY: Photographers & Books. It is a huge honor to have my work included with so many of my photography idols including Martin Parr, Stephen Shore, Daido Moriyama, Joachim Schmid, Kirk Crippens, and Larry Fink. Also included are two 23 Sandy artists, Bea Nettles and Heidi Neilson. This exhibition is on view now through December 30, 2012. Stop by if you happen to be in the Cleveland area. 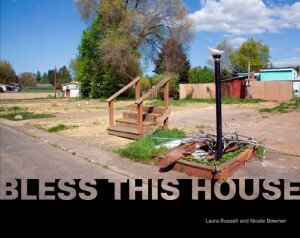 Bless this House is a photography project created with Nicole Bowmer documenting the destruction of three trailer parks in Beaverton, Oregon during the depths of the recession. It was a heart-wrenching project to work on for both of us as we watched 247 families lose their homes. 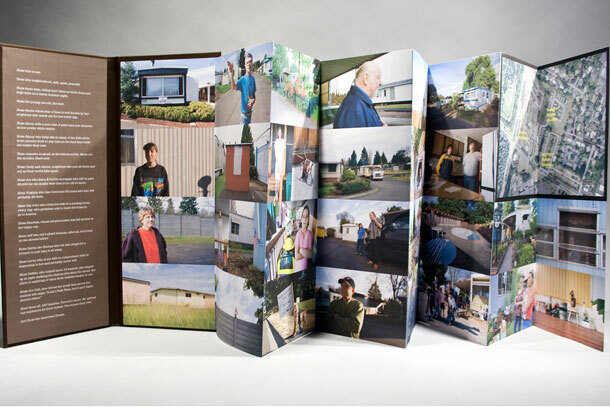 A new golden age of the photobook has dawned, thanks to digital printing technology and web-based distribution services that allow rapid, inexpensive production of books in quantities from one copy to thousands. This exhibition is the first museum show to focus on the impact of print-on-demand publishing on contemporary photographic practice. Instead of images on the wall, the room will be dominated by a long table where a visual banquet of more than 100 photobooks will await the visitor. Several examples of historic and unique books will be in cases, but for most of the volumes, touching, reading, and re-reading will be encouraged. The books will be by regional, national, and international artists. Plans include a computer station where visitors can try their own hand at producing a photobook. See a roster of the books included in the show here. Or, purchase a print on demand catalog of the show here. I’ve been thinking a lot lately about “poetry as lubricant.” Sitting down to write a poem is a great way to get the creative juices flowing. Some people journal or write morning pages (as in The Artist’s Way). I like to start a fresh studio day with a poem to clear the decks, leave the to-do list behind and go deep inside myself. Focus. Clarify. Meditate on words. Urban Decay © Laura Russell. Click on this photo to see a larger image. Note the baby crib inside the front door. dripping like soft fruit in a juicer. no more baby cribs. It’s all gone. How much longer can these empty shells stand? when the future of your factory town is gone. This poem ended up one of two in my Urban Decay artist book, which is about my home town of Saginaw, Michigan. You can see more images from this book here. I am very excited that two of my newest artist books were included in the recently released 1,000 Artists’ Books, published by Quarry books. This seemingly gargantuan effort was compiled by Sandra Salamony and Peter and Donna Thomas. I just can’t imagine wrangling that many artists and artworks. The book includes so many artists who are friends and a good number are artists we represent in the gallery. My books included were Good Will & Salvation and Hit The Road, two of my newest titles. Today in the studio I am struggling with structural questions for my newest book, Hit The Road II. This is the Oregon book in the series, the first covered the state of Washington. So far I’ve made three models and nothing is quite “it” yet. My plan this afternoon is to shut off the email, silence the phone and immerse myself in the 1,000 (make that 998!) incredibly inspiring artist books featured in this treasure chest of a book that will surely be inspiration for years to come. I have been photographing brick wall ghost signs for nearly 15 years now. Finding these beauties is much harder in Oregon than it was in Colorado. Back in that sunny, dry, high-altitude state, brick wall ghost signs seemed to last forever due to climate, lead-based paint and plenty of brick walls. Here in Oregon most buildings are made with wood siding and with all of the rain we get here ghost signs don’t have a chance. My favorite ghost signs were painted back in the days before the concept of being political correct entered our awareness. Today we could never talk about “Whisky for Medicinal Use” or “Indian Traders.” Even advertising explosives just doesn’t work these days. Here is the design for a new card I created using some of my favorite wall dog signs. A small project for a light day in the studio. Day 1 in my new studio. I’m so happy to have a quiet space to work. After five years of working like mad on the gallery I’m finally setting up a dedicated studio space—outside the house/gallery. This space is only temporary. 101 days to be exact. But, this is going to be a fantastic summer. I have a whole list of new books to work on plus I need to finish binding the editions of my last three books, All Sinners Welcome, Good Will & Salvation and Bless This House. The gallery has kept me so busy that i just haven’t had time to bind. Plus, at home I just don’t have the space. My studio was in the back room of the gallery, which makes it very hard to make books, what with cleaning up all the time so I can open the gallery. Today’s project is a simple one. Something fun and easy to prime the creative pump, so to speak. I made four different bookmarks for Sarah Bodman’s bookmark project at UWE in England. If you came to the gallery last year and picked up a free bookmark you are familiar with this project. We had bookmarks by librarians for several months and they were a huge hit. I designed four different bookmarks: neon signs from Lakeside, the amazing amusement park in Denver from my Lakeside book (which is soon to be release in a soft-cover version). Plus versions using images of meat in the landscape, ghost signs from my Colorado Wall Dogs project and “Goodwill Girls.” Now today, time to print them all and ship them off across the pond. So happy to be creating again! Wish me luck. Drove by the site of my trailer park project, Bless This House, last week and was surprised to see redevelopment underway. Streets, curbs, light posts, walls, gates and more already built out, just waiting for buildings. The three trailer parks (directly across the street from Nike’s world headquarters) were demolished in 2008, completed just in time for the economic collapse. I thought it would sit vacant for many years while the market recovered. 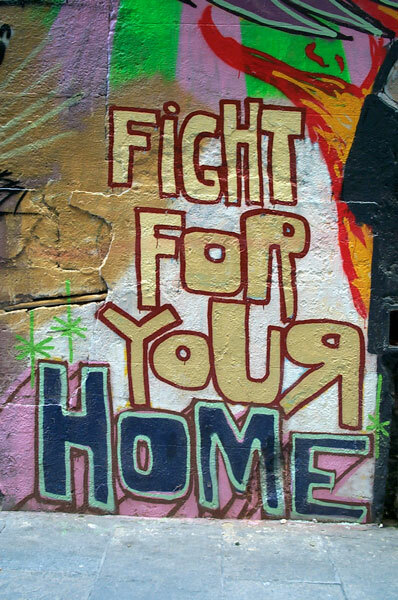 When they displaced 247 very poor families the developers promised affordable housing. Now it is 45 Central, “a modern community of premium homes and shops for those who place a high value on sustainable living and the latest in high-tech design and convenience” according to the developers web site. My friend Nicole Bowmer and I spent nearly three years interviewing the residents of the trailer parks while they were being diplaced. Their stories still haunt my dreams. You can learn more about this project and read the poem I wrote in honor of our friends who lost their homes here. 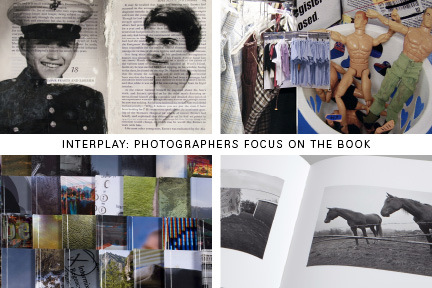 Through May 12 you can see Interplay: Photographers Focus on the Book. My goal in curating this show was to present four photographers who create artist books using very different approaches in terms of style, structure, materials and concept. Interplay showcases one-of-a-kind and limited edition artist books by Elizabeth M. Claffey, Lauren Henkin, Clifton Meador and myself, Laura Russell. From fine bindings to altered books, to print on demand books and pop ups, this show will is an exploration of the crossover between the art of photography and the art of the book. Laura Russell takes a wholly different path in the creation of her limit-edition artist books. As a photographer in the digital world she found herself drawn to bookbinding as a way of using her hands again. After giving up the dark room to go digital, the book arts gave her a chance to step away from the computer screen. Her love of materials and the structural possibilities of the book give her the freedom to expand her photographic images to make books that are sculptural in nature. 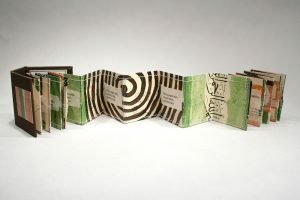 She revels in alternative book forms including pop up books and movable books and frequently incorporates non-traditional materials such as plywood, Plexiglas or Coroplast. Her limited edition, hand-bound artist books are at once a celebration of the vernacular and her own small efforts to preserve our social, cultural and commercial landscape. Click here to see my work plus those three other very talented artists who I am very proud to be showing with. I just invented a new kind of poetry. Think of it as concrete poetry for the digital age, but randomly created. In working on my new book I wanted to write some kind of text that would add another layer to the images, as I try to do with all of my books. Page two of my new All Sinners Welcome book features what I am calling a “word cloud poem” created using an InDesign script called Wordilyzer. 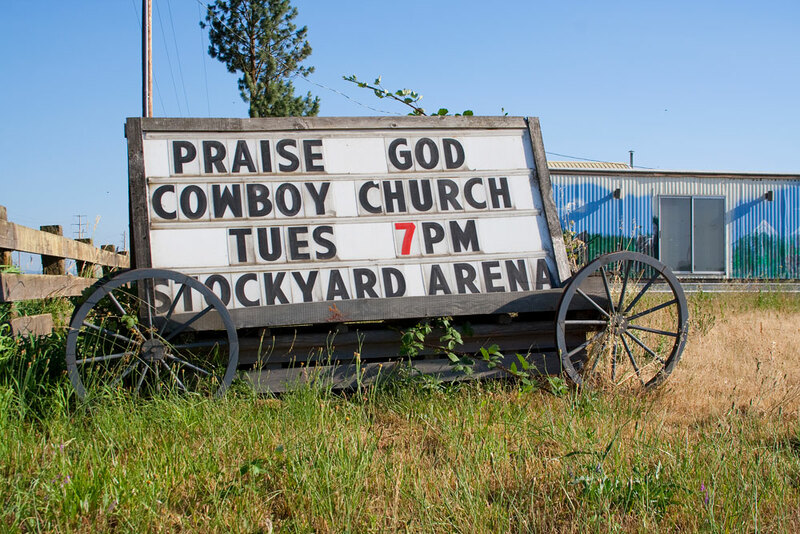 The words in the poem are taken from the tag lines and sayings on the nearly 200 handmade signs on storefront or do-it-yourself churches that I have been photographing over the last six years. I started out by typing all the text from the signs into a document. The script takes those words and generates a “word cloud” of the most frequently used words. The larger the word, the more frequently is was used on the signs. Running the script is all very random. I can select the font and a few other options, so that each time I press go it produces an entirely different poem. This is what resulted after spending much too much time running the script over and over again until I found just the right combination of words, color, font, size and layout. There you go. Studio day today. Something creative actually happened. Praise the lord! See the new book here. A friend recently asked me this question: What are some of the benefits you’ve experienced in creating handmade books versus a book like blurb or offset produced book? A great question to ponder these days as I work hard to re-establish my studio habit. The biggest benefit of creating handmade books is the feeling of accomplishment that comes from working with my hands and utilizing a broad array of very tactile materials to create unique works of art that go so far beyond the machine-made book. 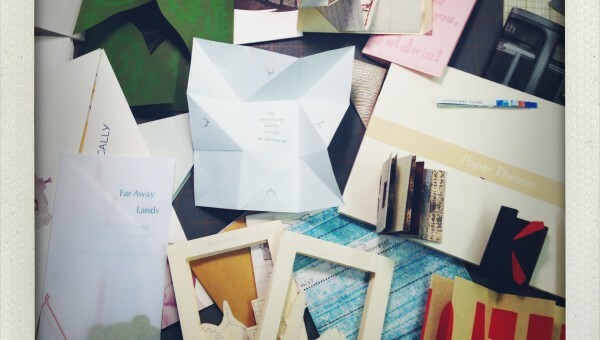 With machine-made books your creative workout goes little beyond sequencing and very minor size and paper options. Having been a graphic designer from the days of wax and ruby and having been a photographer from the darkroom days, I found that I truly missed working with my hands when both areas went digital. What drew me to making handmade books was the need to get away from the computer and create something on a deeper level. It is just so much more satisfying to me to make something with my hands, plus I find working to solve all of the complex creative decisions involved in producing a book by hand to be incredibly satisfying. On a totally unrelated subject: Here’s an image that came to my mind today when I read an article about the “Unsettle Portland” movement. I don’t agree with their tactics, but the article did make me appreciate how lucky I am to have such a secure and happy home. This project has been in progress for a few years now as I’ve collected photographs of what I call “DIY Churches.” And, one of these days I’ll feel that I’ve shot enough photos to have a complete body of work and this project will become an artist book. 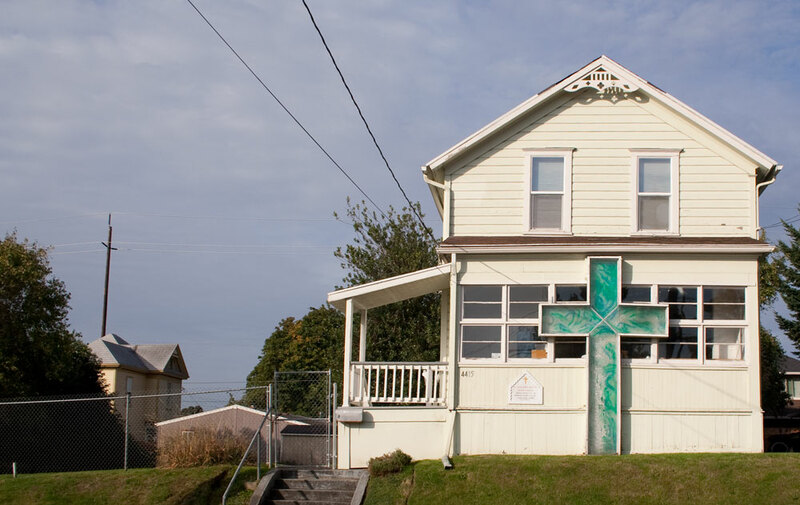 These storefront, home made churches are a fascinating subject for me. Their signage, structures and messages are very compelling for some reason. Maybe it’s the lapsed Catholic in me. I recently ran across this YouTube video, Portals to Heaven, that I created some time ago for a Slide Luck Pot Show event here in Portland. At the time it was very fun work with these church images. Now that my schedule is freeing up a bit and it’s time to get back to the studio, perhaps I should to turn my attention back to this project and either shoot more photos or start designing the book. Tomorrow is my first studio day in a few months. The gallery and other obligations have kept me much too busy lately. Perhaps, with a little faith, the creative winds blow in this direction. I’ve been thinking a lot lately about Bless This House, the trailer park project I worked on with my friend and writer Nicole Bower. We’ll have more details soon, but a quantity of 200 of the POD version of this book is being purchased to benefit a non-profit that works with folks who are struggling to find affordable housing. I am very excited that this book and the social problems this book takes on will get some more attention. In the meantime, below is the poem that I wrote for the handmade artist book version of this book. As I’ve said here before I am a reluctant writer, but this one gets me in my heart every time I revisit the book. Exciting news! 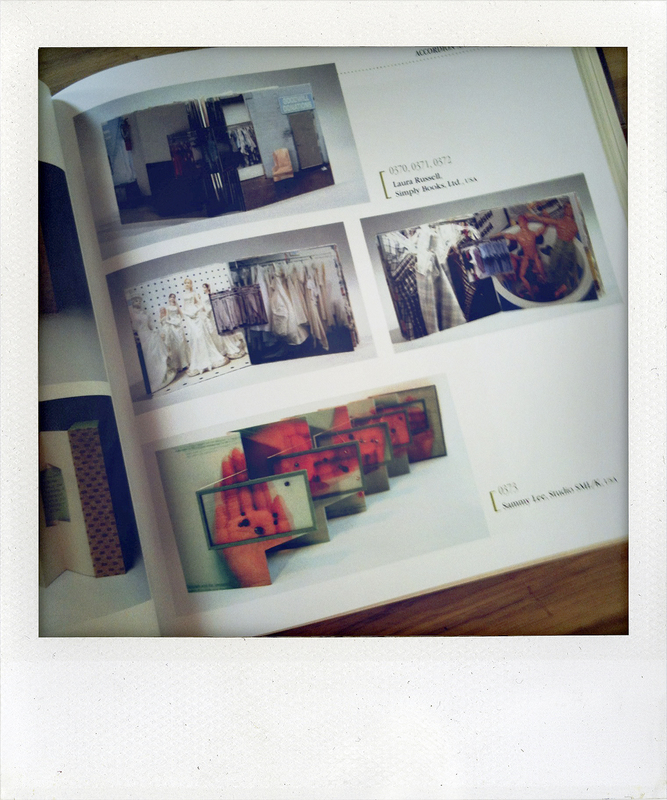 Two of my books, Good Will & Salvation and Bless This House have been selected to be included in BiblioTech, the 2012 College Book Arts Association (CBAA) Juried Members Exhibition. Jurors Emily McVarish and Ruth Rogers chose 64 pieces from over 135 submissions. The show will take place at the San Francisco Public Library Skylight Gallery from January 5- March 11, 2012. The opening reception will be Thursday January 5 from 5:30-7:30pm. I’ll also be giving a talk at the conference called Photographic Artist Books: From Glass Plate to Ink Jet. Hope to see you there. Here’s a link to the CBAA web site. That fortuitous April event was presented to members of the Denver chapter of the American Institute of Graphic Artists (AIGA). Diana presented a slide show of artist books and other types of paper arts. The photos from that slide show were all photos from Shereen’s book, Cover to Cover. Then Diana gave us all a few sheets of handmade paper and we sewed two books, a simple pamphlet stitch booklet and an easy side-bound ribbon binding. (Yes, I still have those books!) Sadly, Shereen passed away in 2003, after inspiring so many artists and a whole movement. To this day I can go through Cover to Cover and tell you exactly which books were in the slide show and why they proved to be life-changing inspiration to me. That slide show is why I am where I am today. I like to say I that at that moment I was infected with this disease called book arts. After that night I started taking every book arts workshop I could find in Denver, plus I even traveled as far as Guatemala to take a workshop. Today, all these years later, I still make my own artist books plus have the great honor of owning my little gallery that specializes in all things book and paper. Thank you Diana and thank you Shereen, wherever you may be. BTW, at that little gallery of mine called 23 Sandy Gallery we carry on of Shereen’s original limited edition artist books. Click here to learn more about Historical Jewish Wedding Rings. This page also contains Shereen’s biography and her artist statement and if you are at all like me you’ll find it very inspiring. I consider myself a reluctant writer. Most days I procrastinate over writing even the simplest web copy, press release, or letter—all of which are required regularly for my business. But, when it comes to writing text to include in one of my books I love the challenge and the process. Here is the poem I wrote for Casa Milà, my tribute to Antoni Gaudí. and the glitter of truth. Thank you for visiting my web site. My name is Laura Russell and I create limited edition and unique artist books, most often utilizing my own photography. 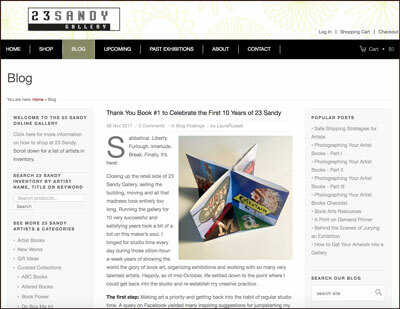 I am also the owner of 23 Sandy Gallery, a fine art gallery focusing on the book and paper arts in Portland, Oregon. Stay tuned for more info coming soon.